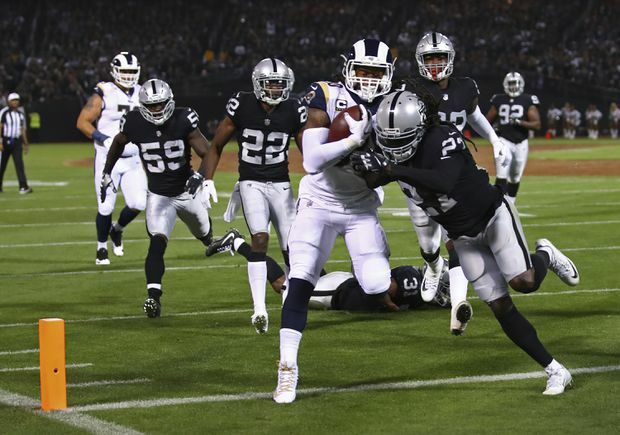 Los Angeles Rams running back Todd Gurley carries the ball over the goal line for a touchdown as Oakland Raiders defensive back Reggie Nelson attempts a tackle on Sept. 10, 2018. Once Jared Goff and the Los Angeles Rams offence got started after sitting out the entire preseason, they couldn’t be stopped. That might have contributed to the shaky start. The Raiders (0-1) moved the ball relatively easily and the Rams struggled to finish drives. But Los Angeles flipped the script in the second half, outscoring Oakland 23-0 and showing why this team is considered one of the favourites in the NFC after last year’s breakthrough season that ended with a division title. Oakland managed just six points the rest of the way against a defence fortified by the off-season additions of former All-Pros Peters, Aqib Talib and Ndamukong Suh. Los Angeles tied it at 13 on a field goal by Greg Zuerlein on the opening drive of the third quarter and then took the lead for good on a 58-yard, four-play drive that featured two passes downfield to another off-season addition, Brandin Cooks, and then the 8-yard TD to Cooper Kupp.